Blank dice can spark the imagination and inspire creativity. You can write, doodle, etch or color each side of your blank cube canvas. Create a new game, liven up household chores or inspire learning. Design your dice with words, images, symbols or art that hold a special meaning to you. My advice is to pick up a set of blank dice with labels. You can write on the labels, stick them on the sides of the dice and complete a custom dice creation. Unless you excel at writing tiny letters or numbers, it helps to buy large dice, say 25mm in size (standard size is 16mm). Consider another excellent option too: Indented Blank Dice. Stickers affixed to indented dice don't wear off as quickly or potentially alter the results of a roll. Read more about their benefits before deciding if they're the right choice for you. Teachers, very creative folks, will find it easy to incorporate these blank cubes into a class lesson for students; especially when they can customize them with a small label. You can create alphabet dice or history dice or geography dice. Don't let the math teachers have all the fun! Not to sound like a broken record, but the possibilities are endless. Parents can even get in on the fun. Create "decision" dice for chores or rewards or to help determine what's for dinner...or even better, dessert! If education is your intent, then consider buying jumbo foam dice, which are 50mm in size (typical game dice are either 16mm or 19mm). The larger the blank dice, the easier they are to customize. Blank numerical dice are popular in games too. Typically, these 6-sided dice have one blank side (usually the "1" pip). You can add a sticker or marking to the blank side for an interesting twist. You'll find some companies buy custom dice with their logo etched on the blank side. Blank dice vary in colors and number of sides too. 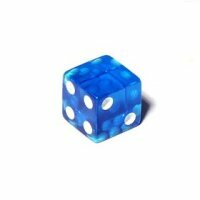 Choose from blank white 8-sided dice, 10-sided white dice or blank 12-sided dice. Undecided? Or prefer a variety? Then choose a 6 dice set with a variety of sides. Plenty of color variety exists too. 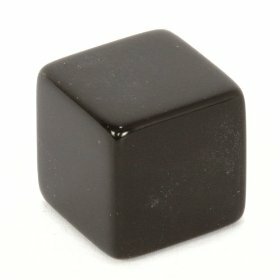 You can pick up blank opaque dice in 16mm black or 16mm red or yellow. Blank translucent dice are available in green and also red. However you decide to design them, be proud! You're creating a set of one-of-a-kind dice. Remember to have fun!